TVS has a rich, passion-fuelled history in the racing industry. It all started in 1984 when a TVS moped clocked a whopping 105 kmph. Then, in the following years, the company won numerous rallies with legendary motorcycles like the Shogun and the Shaolin. In 2005, the TVS Apache RTR was born, reinvigorating the track racing scene in the country and winning multiple national racing championships. And now, it has a new weapon in its arsenal - Apache RR 310. TVS Motor Company launched its fully faired flagship performance offering, the TVS Apache RR 310, on December 6, 2017. 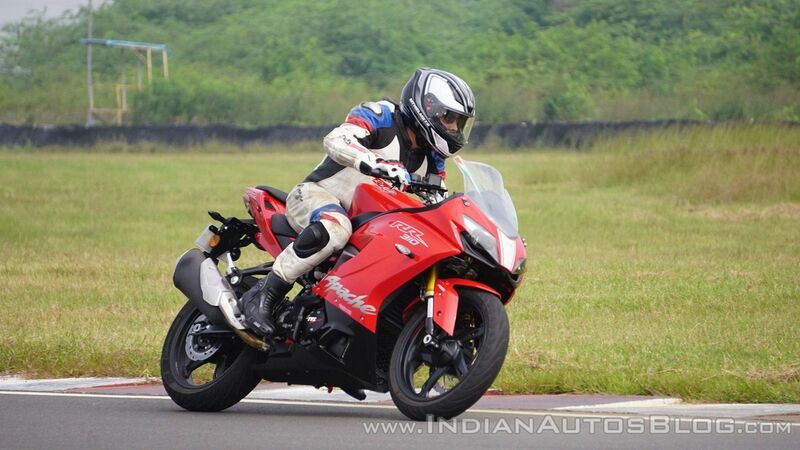 We got to sample the bike at the Madras Motor Race Track near Chennai; and here’s what we have to say about the motorcycle. After sketching as many as 11 sports bike concepts, the company finally locked in on the Akula. In 2016, TVS showcased the Akula 310 Concept at the India Auto Expo, and boy did it look good! For the uninitiated, ‘Akula’ means ‘Shark’ in Russian, and its DNA is evident in the bike’s design. 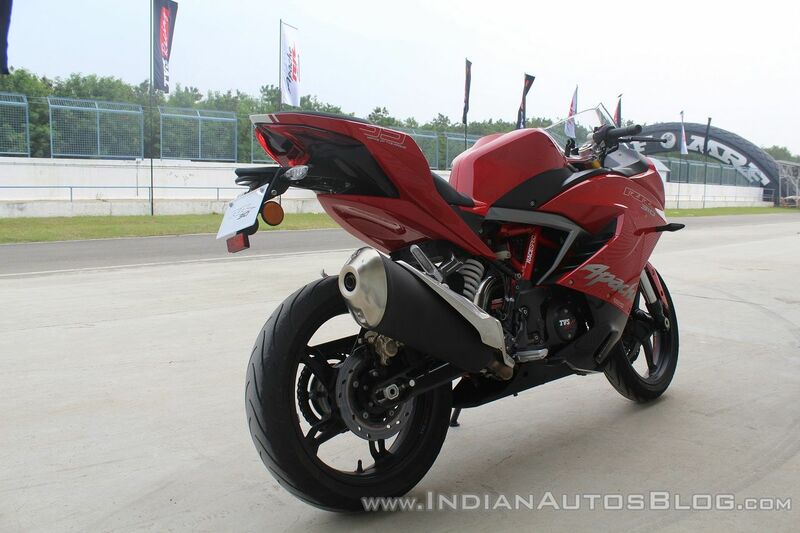 The TVS Apache RR 310 looks particularly ravishing in Racing Red colour. 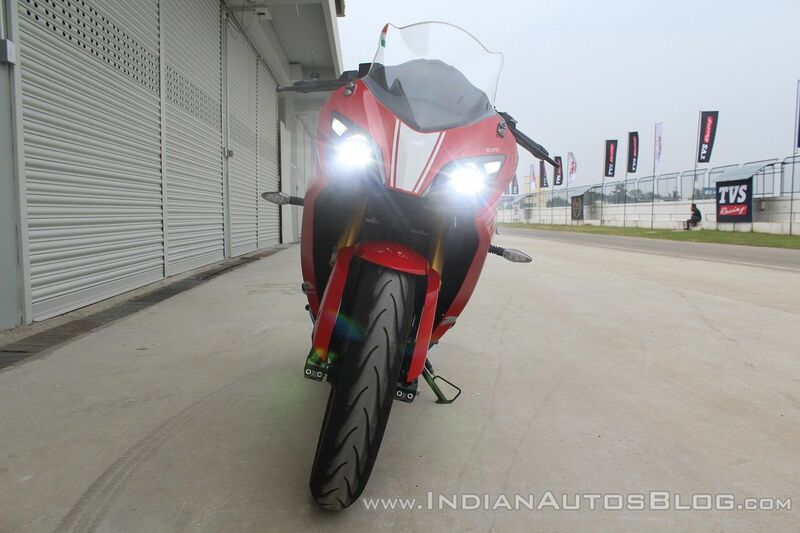 The paint quality is top-notch, and the white stripe running down the headlight fairing and the tail section (in the red colour variant) adds to the sporty appearance. With brilliant attention-to-detail, the shark-inspired RR 310 is a seductive temptress when compared to it Bavarian cousin and its girl-next-door looks. This is a bike that will make you look back every time you park. The fairing has just the right amount of cuts and angles at the right places to make the side profile look fluid. I just wish the fairing had the RR 310 stickers alone, as it would’ve resulted in a much cleaner, elegant look. What’s more, the bodywork is carefully designed keeping aerodynamics and thermal management in mind. TVS says wind-tunnel testing, and optimisation using Computational Fluid Dynamics have resulted in the lowest drag coefficient in the 300 cc segment, at 0.26. The sharp headlight fairing at the front imitates the snout of a shark and features Bi-LED headlamps. This is a first-in-class feature, and TVS says the throw of the headlamp is more than 100 m in high beam. The claimed life of the lighting system is over 5,000 hours. A tall bubble-type windscreen, which is useful for keeping the wind blasts away, sits atop the headlamps. The chiselled fuel tank is nice to grip, and bears the TVS logo on the sides. An additional 3D RR 310 logo at the top is a nice touch. 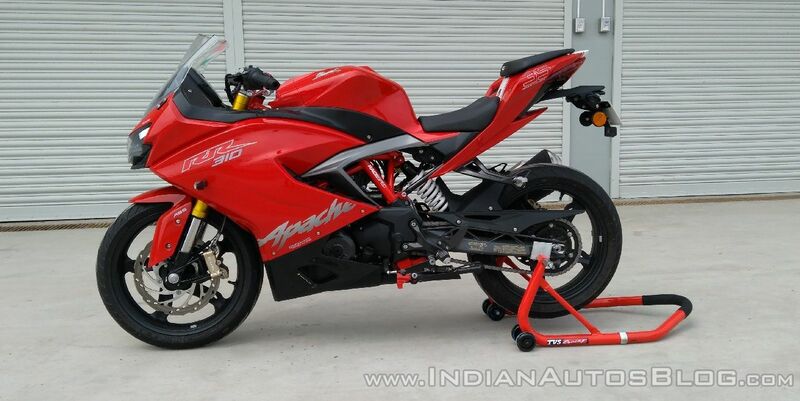 The Apache RR 310 gets split seats, and the rider’s seat has enough room to move about while cornering. The pillion seat, however, looks small and may be suitable only for short rides. The rear is high-set, with snake fang-like LED tail light. LED indicators flank the short number plate holder which accentuates the meaty rear rubber. The side-slung exhaust is a single-piece unit, and the design is similar to its German cousin. Let’s talk about the instrument cluster first. It is an all-digital affair, and TVS says they have opted for a vertical layout in order to make the fairing narrower and more aerodynamic. It takes time to get used to reading the cluster since it is in portrait format. A host of features like lap timer and lap info, trip 1, trip 2, low fuel, and day trip meters, distance to empty indicator, top speed, average speed, and launch time (0-60 kmph) display, instantaneous and average fuel consumption readouts are present. The cluster also has a gear shift and gear position indicator. 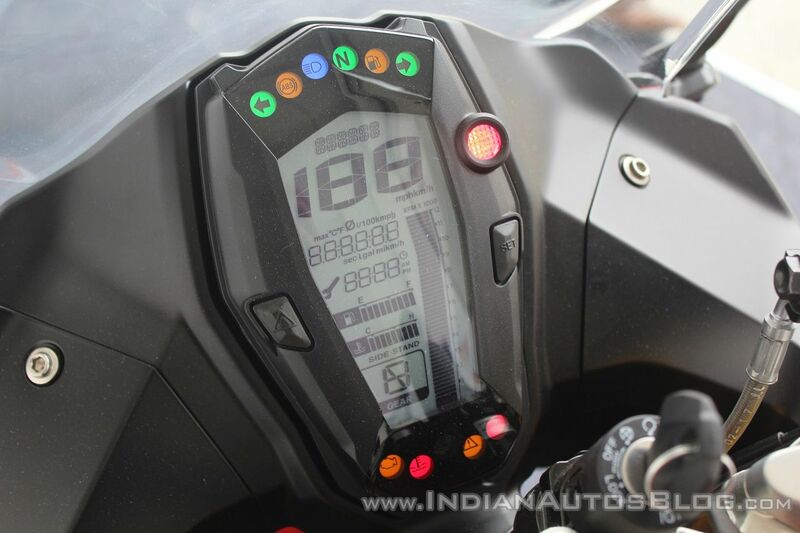 The refresh rate of the digital tachometer could’ve been more accurate to ensure the bars keep pace with engine revs. The electrical system is said to be highly reliable, thanks to CAN bus system, sealed switches and sensors. There is a small storage area under the pillion seat which is enough for keeping the bike’s paperwork and first aid kit. The fuel tank has a volume of just 11 litres, which might be a limiting factor while touring. However, it is understandable that the company had to settle for a small capacity tank in pursuit of better handling dynamics of the motorcycle. The TVS Apache RR 310 shares its platform with the BMW G 310 R, and TVS has spared no expense in making the engine as tech-laden as possible. The powerplant features a reverse inclined layout for better mass centralization. Since the engine head is inclined on the inside, they were able to extend the swingarm without increasing the wheelbase, resulting in optimum stability. The mill comes with Dual Overhead Camshafts and a horizontal split crankcase which is commonly used in high-end bikes. Another high-end feature is the cylinder-head downdraft port with button tappet arrangement. This arrangement offers 8% more air-flow, thereby achieving higher volumetric efficiency. The intake system is located on the upstream side, which results in better breathability. The mill features fuel injection and liquid cooling with oil-water heat exchanger. With all that noteworthy tech, the powerplant generates 34 PS of power at 9,700 rpm, and 27.3 Nm of torque at 7,700 rpm. The engine works in conjunction with a 6-speed transmission with negative back-rack gears for quick shifting and avoid false neutral. Riding on the track, the power delivery of the engine felt very linear, which is confidence-inspiring especially for rookie track riders like me. Thanks to the race-origin lightweight trellis frame with twin-arm aluminium swingarm, the bike is delightfully flick-able with good feedback while going around corners. I did miss the line at a couple of corners, but the bike’s assuring dynamics safely carried me away from the heart in mouth moments. 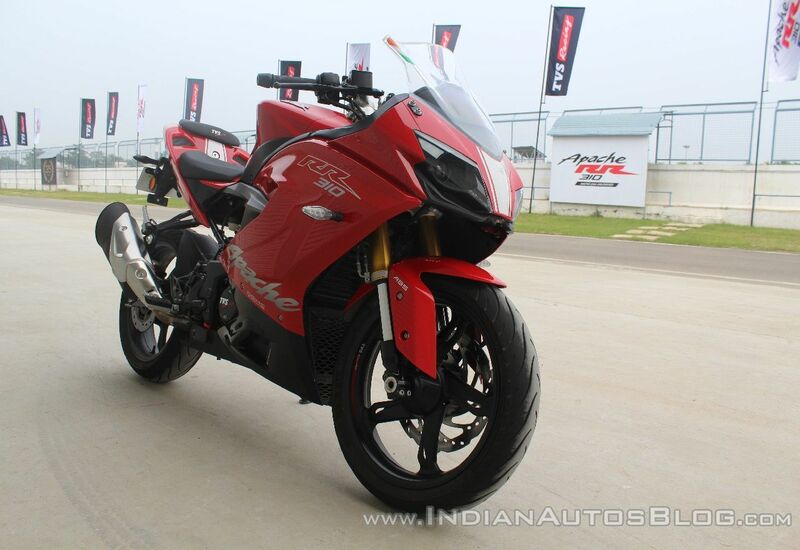 TVS says the bike can accelerate from a standstill to 60 kmph in 2.93 seconds, hitting the 100 kmph mark in 7.17 seconds. 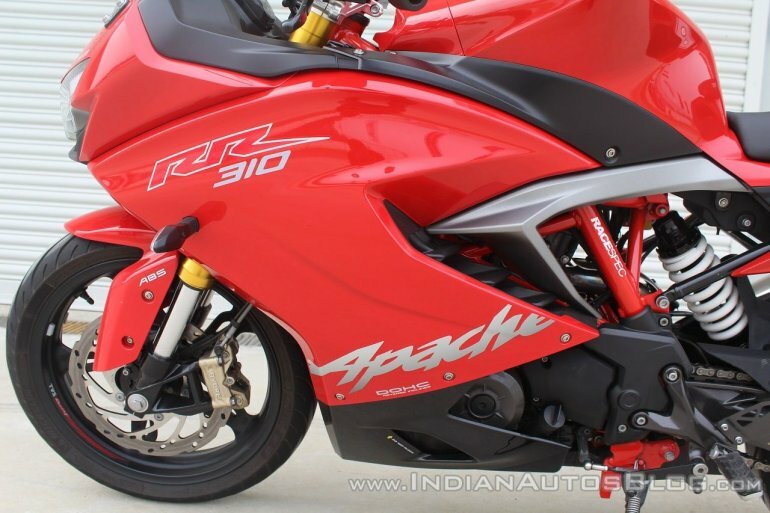 The Apache RR 310 can go on to hit 160 kmph, claims TVS. The engine sounded a bit harsh upwards of 7,000 rpm, with vibrations creeping in onto the sides of the fuel tank and the seat. However, it is too early to judge the engine refinement as it was not run-in and had been pushed to the limits at the race track. Surprisingly, the average fuel efficiency reading showed 22 km/l, despite being ridden rather aggressively around the track. If the readings are anything to go by, one can expect around 35-40 km/l in city and highway conditions combined. 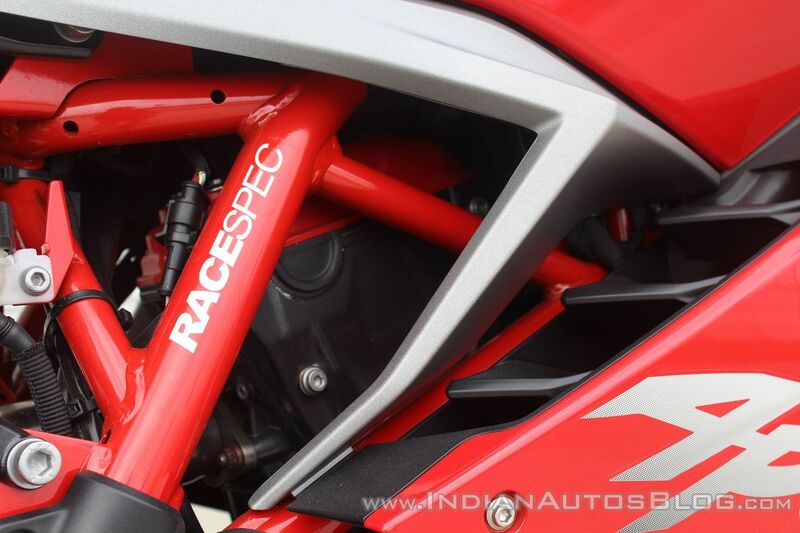 The TVS Apache RR 310 rides on 41 mm upside-down cartridge-type front forks; and a rear pre-load adjustable monoshock by KYB with Monotube floating piston technology. The suspension had good feedback and damping characteristics. Although it did feel a wee bit soft for track rides. I’m sure the settings would be perfect for day-to-day usage. 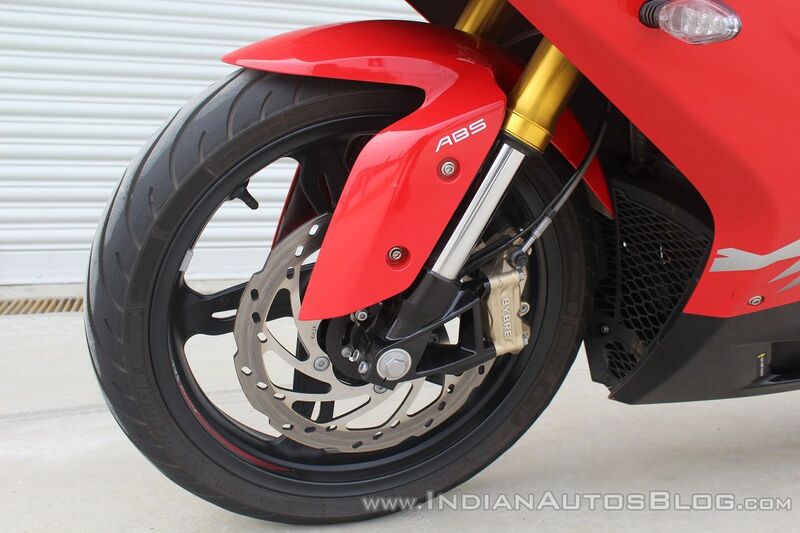 The 110-section front and 150-section rear Michelin Street Sport tyres offered a great deal of grip on the track. But they will leave you craving for more if you’re pushing the bike to its limits. The 300 mm front and 240 mm rear petal discs were nicely progressive, as the Bybre callipers bite hard enough to decelerate with ease. The dual channel ABS features rear lift-off protection, which would come in handy in hairy situations. The motorcycle rolls on Wanfeng alloys that have the same pattern as those worn by the G 310 R, but they have strengthened the wheel keeping in mind Indian road conditions. The TVS Apache RR 310 has been priced at INR 2.05 lakhs, ex-showroom (varies from state to state) making it approximately INR 26,000 cheaper than its closest rival, KTM RC 390. At present, there are only two colours available - Racing Red and Racing Black - but the company will bring in more colour options depending on demand. The bike will be available in select markets by the end of this month. TVS has implemented a lot of performance-oriented technologies to make this bike competent enough to take on its rivals, and it is quite evident how wholeheartedly the company has worked on the motorcycle. The tameable character of the bike, coupled with killer looks make this a value proposition for riders who are looking for a do-it-all motorcycle. The good build quality and TVS' fairly satisfactory after-sales experience sweeten the deal further. 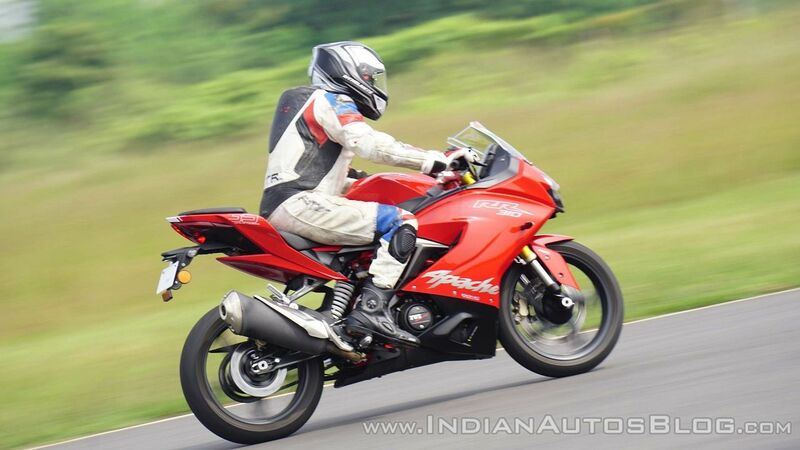 Compared to the competitors, the TVS Apache RR 310 has struck a nice balance between performance and practicality.